In the last two weeks, part of the tragic aftermath of Japan’s earthquake reached North America in the form of radioactive fallout. While many Americans are unaware of this fact, officials know this because it ended up in our milk supply. Specifically, radioactive iodine-131, a radionuclide that emits beta particles, showed up in milk samples in both California and Washington State. With a half-life of 8 days, once ingested by humans iodine-131 concentrates in the thyroid gland, where it emits cancer-causing radiation until it fully decays. The greatest exposure to radioactive iodine-131 comes from drinking cow’s milk. Although there was far less reporting about it, after the Chernobyl nuclear plant melted down in 1986, its radiation reached the United States within 9 days. In May and June of 1986, levels of radioactive iodine-131 measured in milk were 7 to 28 times above normal levels. Just recently it was also reported that 25 years after the Chernobyl meltdown, the milk supply in the Ukraine still contains hazardous levels of cesium-137. With a half-life of 30 years, this radionuclide will continue to pose a risk of cancer to hundreds of thousands of people living in the region until at least 2016. Like many other contaminants humans produce, radioactive elements enter into waterways and eventually into the food chain. As plants absorb tainted water, they concentrate the radioactive matter. Grazing cows then eat the plants and drink the tainted water, and the radioactive particles concentrate in their bodies. The most common radioactive elements released from nuclear power plants include strontium-90, iodine-131, and cesium-137. Strontium-90, a carcinogen with a half-life of twenty-nine years, is one of the most dangerous elements found in radioactive fallout. When ingested through food or water, it is absorbed through the bowel wall. Because its chemical structure is similar to that of calcium, it concentrates in bones and teeth, where it emits cancer-causing beta particles as it decays. We’ve known that radioactive particles make their way into cow’s milk for many decades. One of the first well-known incidents was in 1957 when Britain experienced a major nuclear accident. Its Windscale nuclear facility (since renamed Sellafield) released a massive radioactive cloud containing iodine-131, cesium-137, and xenon-133, which soon descended upon agricultural fields. Once officials noticed the high levels of radioactivity in the milk, they ordered thousands of gallons poured into the sea. 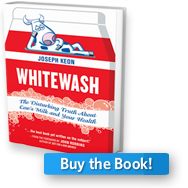 Although American officials have attempted to quell any concerns over consuming radioactive milk by telling consumers the amount is too small to pose a risk, there’s no scientific basis for such an assertion. A safe threshold for exposure to ionizing radiation has never been established. Like exposure to medical x-rays, each exposure is cumulative and adds to one’s lifetime risk of developing cancer. Children and pregnant women are at particular risk. Given that cow’s milk is unnecessary for human health, and that it frequently contains a plethora of other industrial contaminants, the most prudent action one can take is to avoid milk entirely.